Two try Kieran Redfearn took the man of the match award as Featherstone Lions just held out at Ince Rose Bridge to collect another two points in Division One of the National Conference. Lacking a host of players through suspension and injury, the Lions knew they would be up against the rails especially as the Wigan outfit have been their bogey side in the last couple of seasons. They trailed 12-0 early, hit back to lead 22-16 in the second half, but then conceded a last-gasp try only for their hosts to be unable to convert it to rescue a draw. Featherstone started well enough with in-form Ben Mawson, Scott Wilson and George Nuttall all going close, but it was Ince who opened the scoring when poor defence allowed them to stroll through for a converted try. A second try followed and left the Lions with some work to do, but they rallied and Dean Gamble from acting-half twisted his way over for a try that was converted by Ian Jackson. More strong pressure saw Scott Glassell go close before some fine handling led to Davi Garahan sending Redfearn over with a gem of a pass he got away despite having two defenders round him. The hosts replied almost immediately after getting the ball from the restart as they scored down the same flank as the first two of their tries to lead 16-10. Ricky Williams made a fine cover tackle on Bridge’s pacy centre to prevent a further home score before the Lions hit back with a sparkling try as Jackson’s superb ball after some good handling saw powerful winger Redfearn hare 35 yards to the line for a try. Jackson then landed a towering touchline conversion to send Featherstone in level at the break. Glassell was held close to the Ince line in the opening stages of the second half and Garahan was hauled down on the line with Redfearn screaming for the ball for his hat-trick. Mawson, Brendon Gibbins – who had a big second 40 – Gamble and Nuttall all put in some big defence as Ince hammered at the Lions line. But after weathering the storm a deft pass by Gamble saw the strong running Mawson burst through for a try. Jackson added the extras to put his side into the lead for the first time in the game at 22-16. 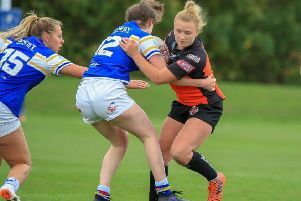 Ince were not going down without a fight, however, as they put Featherstone under severe pressure with their big prop and lively stand-off trying everything they knew. Jackson and Gamble saved a certain try with some fine cover tackling before Mawson, Gibbins, Nuttall and the hard working Wilson took the Lions back up the other end of the pitch. With two minutes left Ince scored in the corner after creating an overlap, but the conversion drifted well wide to leave the visitors as the winners. The Lions have no game this weekend before hosting Milford Marlins the following week in a top four battle. Lock Lane dropped down to fourth place in Division One of the National Conference after their late rally came too late to prevent a 32-28 defeat away to Milford Marlins. Trailing 32-16 with eight minutes remaining, the Castleford team put in a big finish and almost turned the game on its head as first Paul Brown then Craig Jones went over for tries. With Curt McDonald converting both there were only four points between the teams, but the Marlins were able to hold on for the remainder to seal their victory and leapfrog Lock Lane in the table. James Barker bagged a brace for Milford with Martin Loveridge posting a try and six goals and Tom Wilson and Zak Snellgrove touching down. Ethan Flower, McDonald and Ben Strong scored tries for Lane, with Nathan Fozzard adding a couple of goals in a game in which they led 12-6 at half-time. Lock Lane had Danny Sowerby carded twice, with a yellow for alleged tripping on 21 minutes and a red for alleged foul and abusive language on 78 minutes. Thornhill Trojans remain top of Division One after grinding out a 0-8 win over promotion rivals York Acorn. Lock Lane are not in action this weekend with their next Conference game away to Oulton Raiders on Saturday, May 12.